After finishing my first Blaire shirt, I knew immediately I wanted to make a second version. 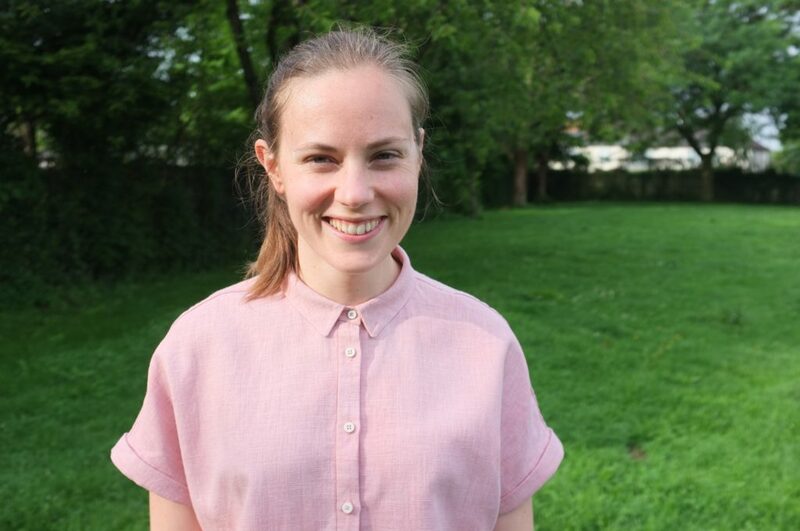 This was exactly the piece of clothing that was missing from my summer wardrobe. With a short trip to Italy coming up, I had some pressure to finish this quickly. 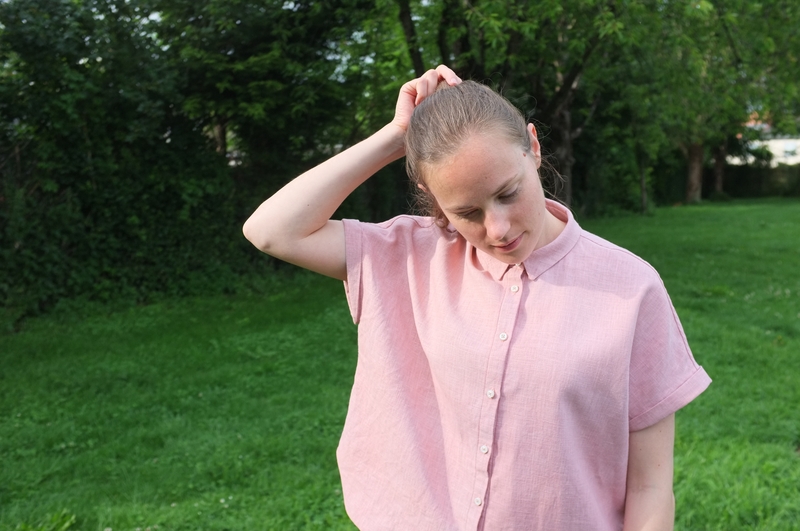 This time round I wanted to try something new: natural dyeing. I’ve been following other sewists on their adventures and was particularly intrigued by dyeing with avocado skin. First of all it would be super easy to source (I love guacamole) and second it produces the prettiest shade of pink. This blush colour is one of my favourites (I’m such a millenial!). I did some research online and came across this tutorial here by Rebecca Desnos. 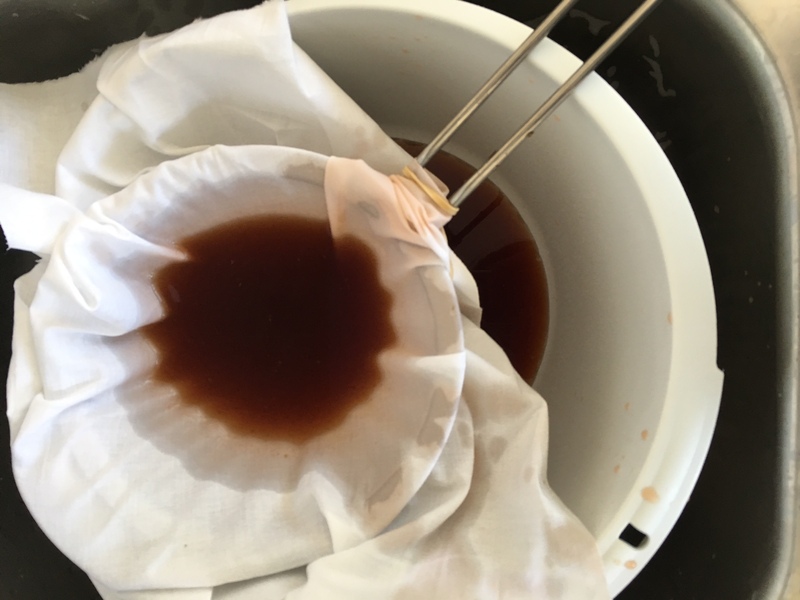 It’s very thorough and uses soy milk to increase the absorption of the plant dye, which sounded like a simple method. I didn’t follow the instructions exactly, due to time pressure, and skipped a couple of steps. So here is what I did. Please keep in mind that I am no expert at this and I haven’t tried any other methods, so there might be better approaches out there. 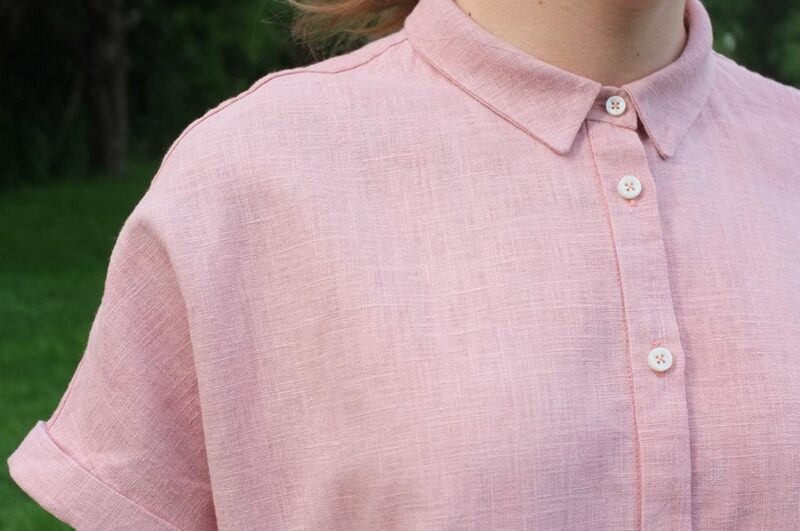 I started with some plain white linen that I got from Ditto Fabrics, they don’t seem to have the exact one online anymore but it looks like this is a similar linen. When it arrived it was a little bit heavier than expected, which wasn’t an issue for the design but meant that I had to collect more avocado skins. According to the tutorial, you should use the same weight in avocado skins as you have in fabric. After collecting avocado skins for a couple of weeks (storing them in the freezer) I was still shy of the 300 grams of skins that I needed. 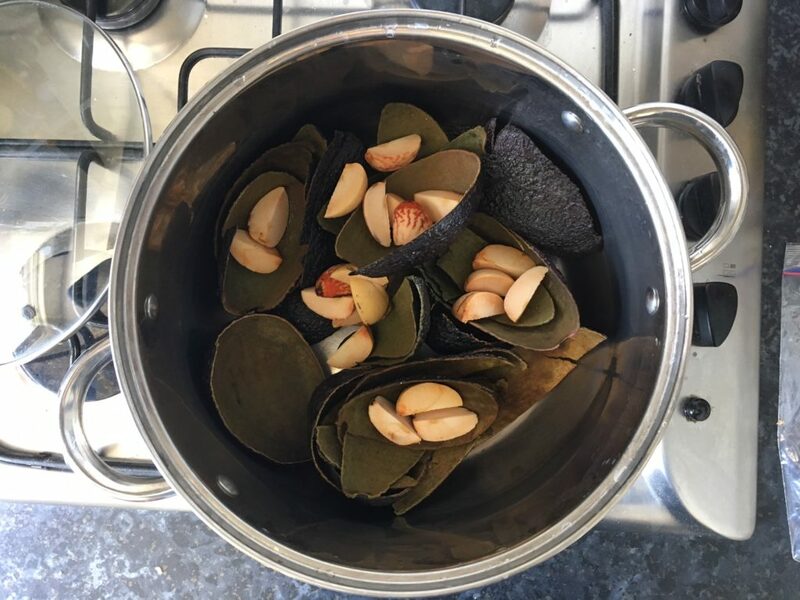 Since dyeing with avocado pits works as well, I decided to just use 5 dried and cut up pits together with the skins of 10 avocados. I prepared the fabric by first putting it through the normal wash and drying it. Then I let it soak in a mixture of soy milk and water over night as instructed, put it through a spin cycle in the washing machine and let it air dry. Next I dipped the fabric again in the same soy milk mixture (only a quick dip to avoid washing out the first layer), put it through a spin and dried it. The instructions then tell you to repeat this step a second time. Since I didn’t have the time for a second round, I skipped that step. I also skipped the step of storing the fabric in a plastic bag for a week before using. Then on to the avocado dye. I defrosted the skins and chopped up the pits, which I had peeled first (probably not necessary but easy to do when the pits are dried). I added them to an aluminium pot and filled it two thirds with water. Next I put it to a boil and let it simmer for roughly 2 hours. 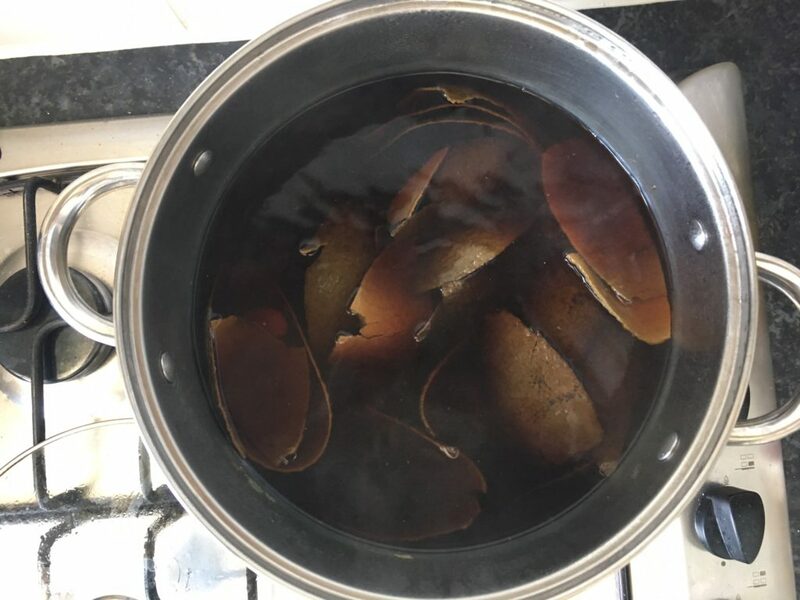 The skins quickly broke down and the water turned a brownish red. After letting it cool down, I put the mixture through a muslin lined sieve. Once heated up again, I added the fabric and a little bit more water to cover it sufficiently. As you can see the pot was a little bit small for all the fabric, so I made sure to move the fabric around a lot to avoid blotches. 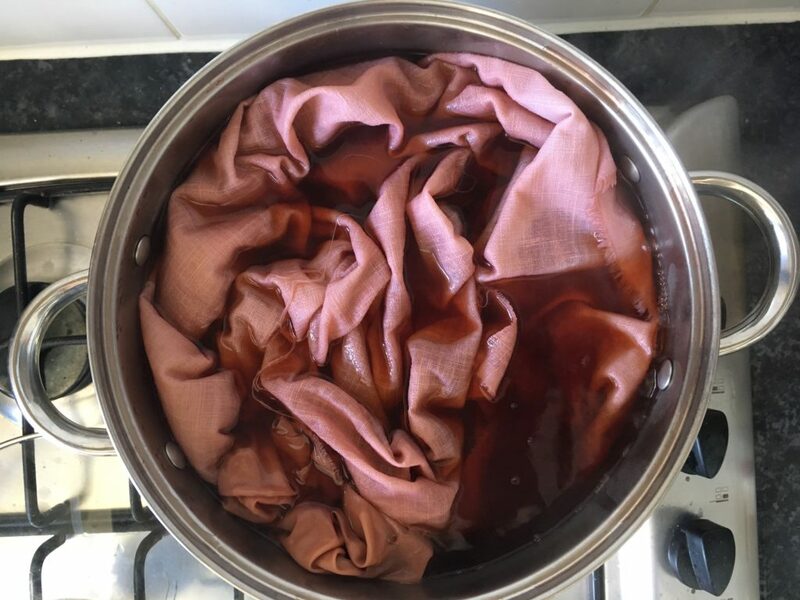 The fabric quickly turned pink and after an hour or two of boiling the fabric in the dye bath I let it cool down again and sit overnight in the pot with a plate holding the fabric under water. The next day I took out the fabric, put it through the spin cycle in the washing machine and let it air dry. The colours turned out beautifully. 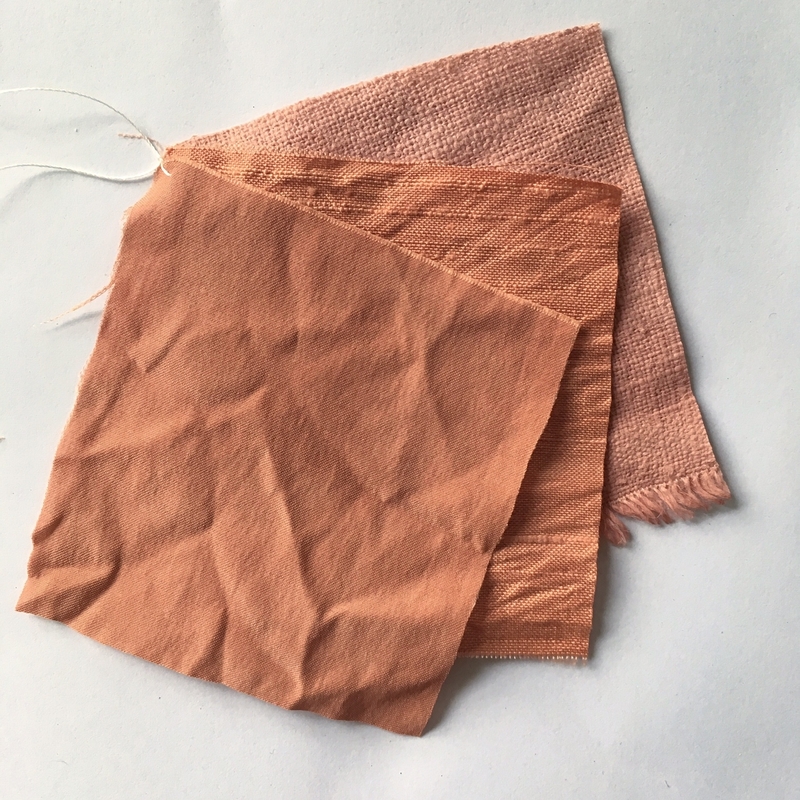 The linen didn’t take the dye as much as some pieces of sand-washed and dupion silk, which I had thrown in to test the colour on other fabric. 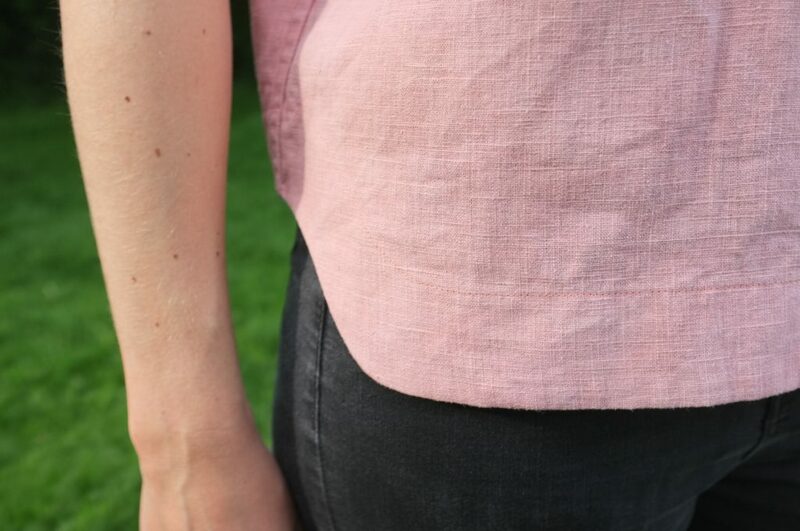 Since I was more going for a blush colour on the linen I was very happy with the outcome. Before rinsing it the fabric is supposed to sit for a week. Impatient to start my shirt, I worked with the unrinsed fabric, which wasn’t a problem, it only slightly smelled of avocado skin. Below some pictures of the process and the final swatches. 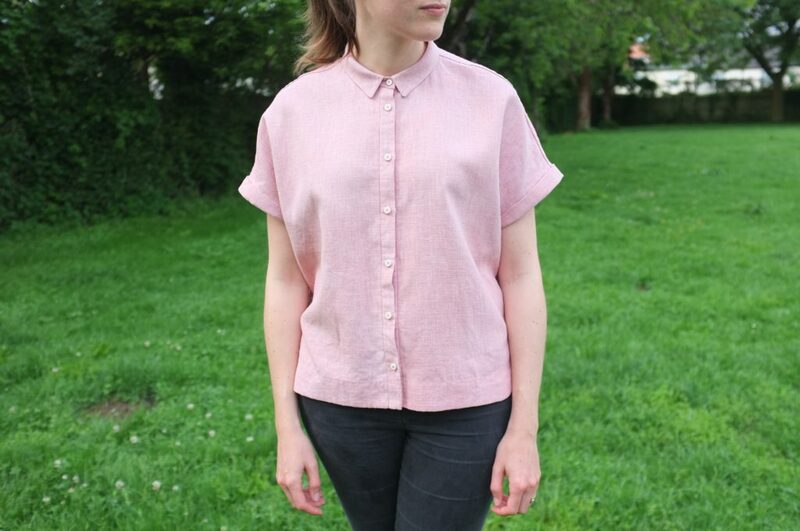 Construction-wise I sewed up the Blaire shirt with exactly the same alterations as my first version. Again I was short of fabric and thus had to simplify the design. As in the other version, I finished the hem with a contrasting facing. This time a Melody Miller cotton that I got from Miss Matatabi. 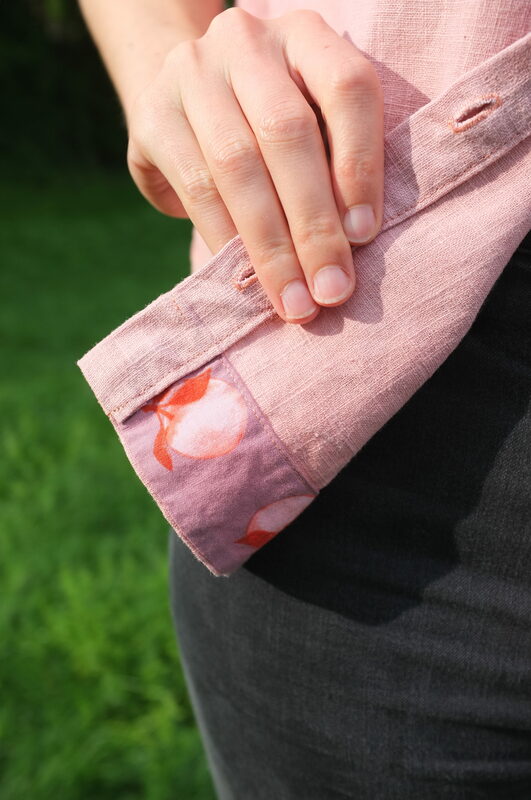 The buttons this time were reclaimed from one of my husbands worn out work shirts. If you’re interested in the colour fastness. Once the shirt was done, I put it through a gentle hand wash and a week later through a 20 degree cycle in the washing machine. Both times it didn’t loose a noticeable amount of colour. I love this shirt so much! 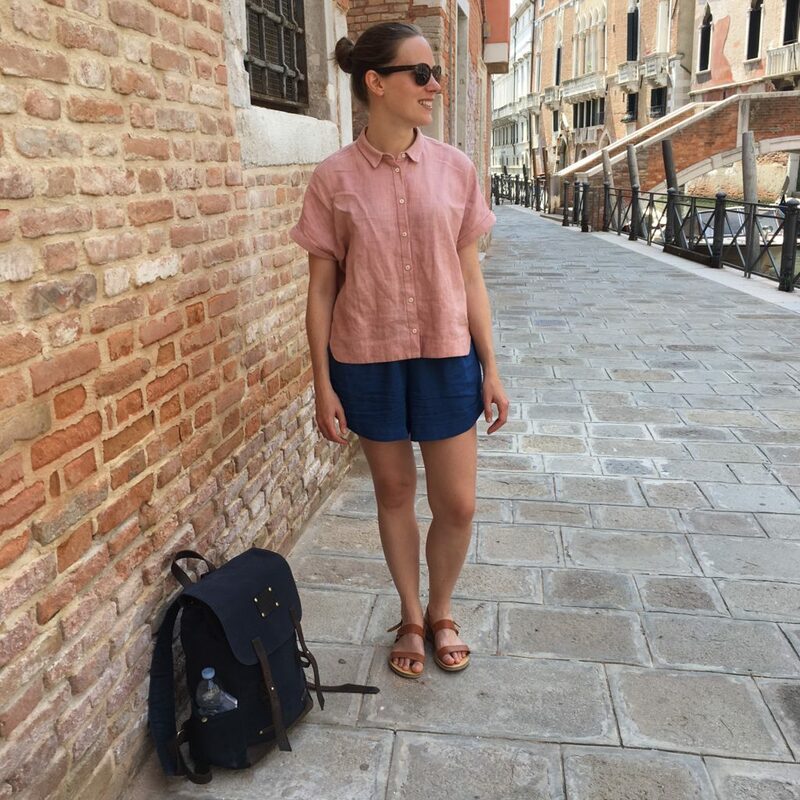 It was the perfect thing to wear on scorching hot days sightseeing in Venice (below a photo in action, a little bit rumpled from carrying around a backpack all day). I also really loved the fabric dyeing process, I now want to avocado dye everything! Unfortunately there is only a certain amount of pink garments a closet can take and I fear I have reached that point. I might have to do some research into other natural dyes next. 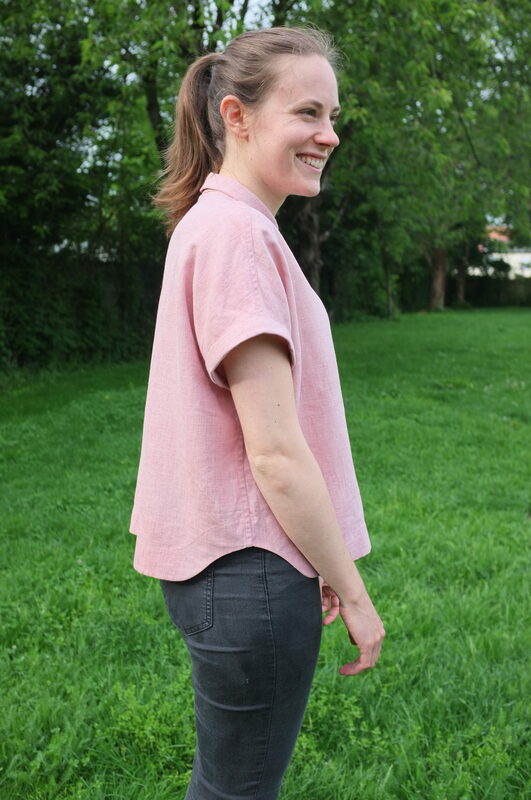 This is also my first finished garment for the Summer of Basics, a make-along initiated by Karen Templer of Fringe Association. 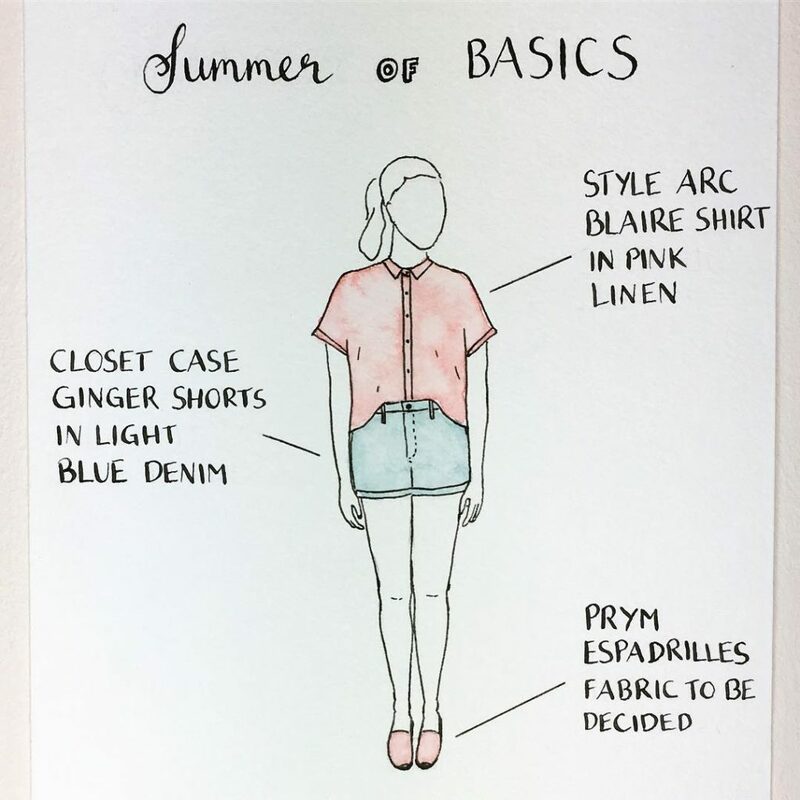 The idea is to make 1 garment a month for 3 months, June through August, with the goal of filling in basic wardrobe gaps. This definitely filled one. I’m now trying to decide on my other two pieces. I’m thinking Closet Case Ginger Shorts and a pair of espadrilles but I’m not 100% sure yet.